Crowley Lake is a water reservoir operated by Los Angeles Department of Water and Power. 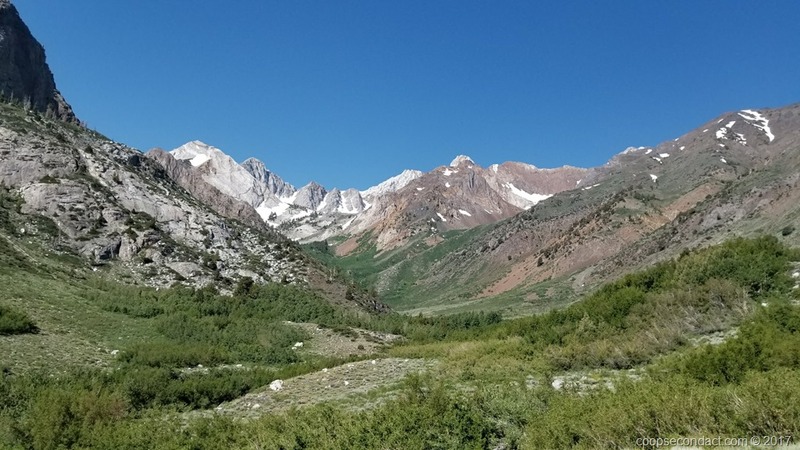 It’s located in the eastern Sierra mountains alongside US 395 about 28 miles north of Bishop, CA. I previously mentioned that we cut short our time in Acton and made new plans. We were supposed to be in Acton until 7/7, then move to Lone Pine, CA, for 3 days and then on to Crowley Lake on 7/10. But when the temp in Acton began to rise past 100 and was forecast to go even higher we began to look for alternatives. Since Lone Pine daily high temps were expected to exceed 100 degrees as well, we decided to skip that and go directly to Crowley Lake since this would put us at a higher elevation and somewhat lower temps. We were able to find space at Crowley Lake Fish Camp starting on 7/6. We then moved to Crowley Lake RV Park on 7/10 as previously planned. While here we took advantage of some of the excellent hiking nearby. One of the hikes we took was the McGee Creek Trail. This creek sits in one of the many beautiful canyons in this part of the Sierras. The creek itself is not very wide, perhaps 8 – 10 feet in most places but it was running fast and furious with snow melt and the trail took us through lots of beautiful wildflowers. Another hike took us on the Hilton Lakes trail. On this hike we reached higher elevations, perhaps 9,000 to 10,000 feet. We got to a point where there was a significant amount of snow still present on the mountain slopes. Convict Lake is another hike that we enjoyed. It is an easy hike around a really beautiful mountain lake that is easily accessible from Highway 395. 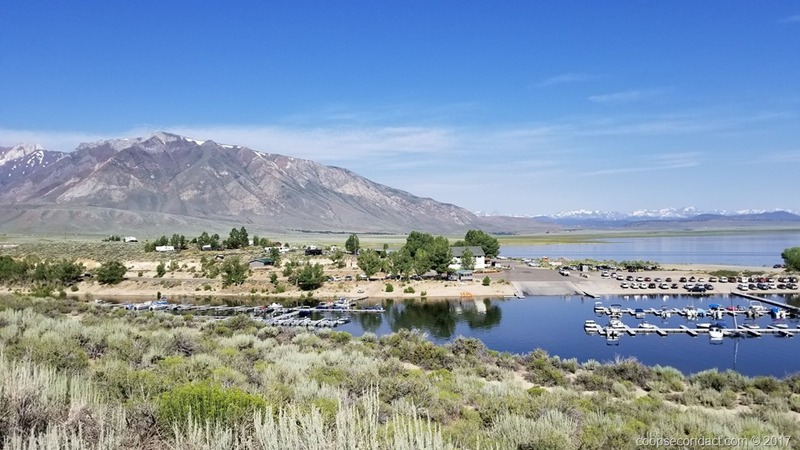 In addition to camping, Crowley Lake Fish Camp has a full marina and offers boat rentals. We rented an aluminum boat with a 20HP outboard engine that allowed us to get out and explore the lake. We particularly wanted to see the unique geological oddity along the eastern shore of the lake. 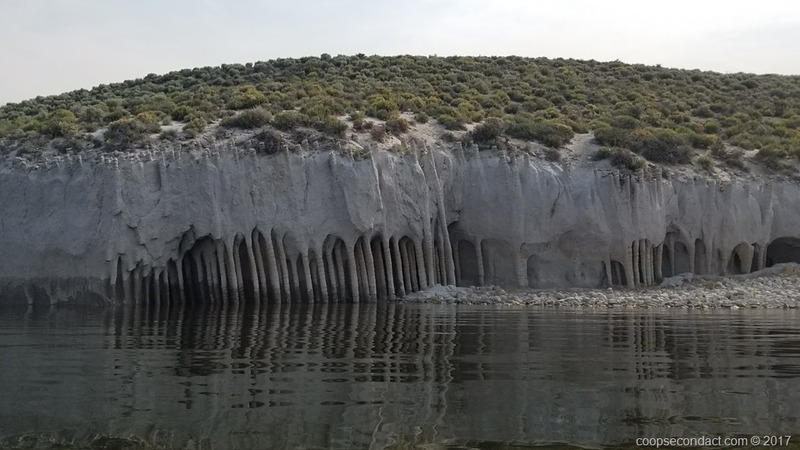 Shortly after the reservoir was formed in 1941, erosion along the shore revealed what appeared to be stone columns. Some of the columns are up to 20 feet tall connected by high arches. It wasn’t until 2015 that researchers determined that the columns were created by cold water (snow melt) percolating down into hot volcanic ash spewed by a cataclysmic explosion 760,000 years ago. Very interesting and unique sight. You can read more about their origin here. Oh, my! I read the article about the reservoir formations. Both Amazing and fascinating! Glad you let us in on such a cool thing.